It is hard to determine when bingo was born. All what the historians know is that similar games were already practiced during the Roman Age. Unfortunately, there are few remains of these inventions and no-one can really tell how their rules looked like. However, we were given information that the Lo Giuco De Lotto was an ancestor of the lotto that we are actively practicing in the United-States. This game was created in the Middle Ages! Its rules were pretty similar to the current game but Lo Giuco De Lotto was used as a pedagogical tool to teach literature and mathematics to the children. Then this game’s name change: it became the Beano. In the United-States, bingo was also initially called Beano. It was apparently popular in fairs: back then, dealers would choose numbered discs out of cigar boxes and gamblers would mark theirs tickets with garden peas or beans. If they won, they would shout Beano. Therefore, there are no much differences with the game we nowadays know. Beano was introduced to France in the 18th century but the Germans also did play this game in their country. Once again, it was rather used to teach history and spelling to pupils in schools’ classrooms. In Italy, Beano was played every Saturday by all categories of people whether they were bourgeois, countryside men or soldiers. In the 1930’s, the game reached out the shore of North America. Again, the game was mostly played in fairs and carnivals in big cities such as Atlanta and New York. In New York, rightly, a toys manufacturer and businessman called Edwin S. Lowe decided to give a new name to Beano. He baptized it bingo after hearing someone yelling bingo rather than Beano, by mistake. Lowe hired a professor of mathematics from the University of Columbia, Mr. Carl Leffler, in order to help him enhance the number of combinations the original game could sustain. Some years afterwards, more than 6, 000 different patterns of bingo card were circulating in the market. Sadly enough, the amount of work was so important for Leffler that the poor guy became mentally insane. 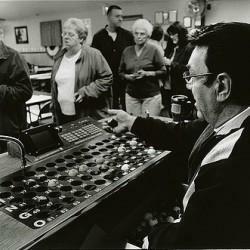 Shortly thereafter the new version of bingo was created, a priest from Pennsylvania requested Lowe’s approval about utilizing bingo as a fund-rising tool. It did not take long before bingo was used by churches in order to fund great causes. In the 1930’s it is said than an average 10, 000 bingo games were played every week. But today, bingo is even more profitable as the North American private operators can generate an annual $90 million income thanks to this incredible game. The online operators are those benefitting from the most rewarding revenues since bingo became an online casino game in the 2000’s.